The axis of the earth is tipped 23.45°. This means that most of the time part of the earth is tipped toward the sun and is getting more sunlight and warmth, and another part is tipped away and is getting less sunlight and warmth. When the northern hemisphere is tilted toward the sun, the days are longer and the sun is high in the sky. The weather is warmer and we have summer. Six months later, the northern hemisphere is tilted away from the sun and the days are shorter and the sun is low in the sky. The temperature grows cold and we have winter. 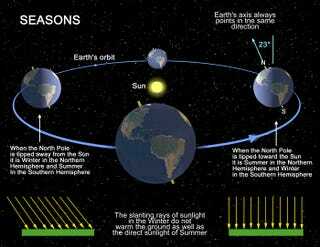 Every planet with an axial tilt has seasons. Mars has a tilt almost exactly the same as earth's, so its seasons are similar (albeit twice as long). Jupiter, on the other hand, with an axial tilt of just 3.13°, has scarcely any seasons to speak of at all. The weirdest might be Uranus, whose axis is tipped 97.77°. There are traditional names for the periods when the earth is tipped at its greatest and least angles from the sun. That day in the spring and fall, when the periods of daylight and dark are of equal length, is called the equinox, for fairly obvious reasons. That day in the winter and summer when the difference between daylight and dark is greatest is called the solstice. This is a French word derived from the Latin solstitium, "the point at which the sun seems to stand still," which in turn comes from the Latin word for "sun": sol and sistere: "to come to a stop or make stand still." It's kind of a bittersweet day, of course, since it's all downhill from here to winter, with every day getting a little shorter.